I serve as Director, Strategic Communications. I’ve spent the last 25 years as a corporate executive in the St. Louis area. 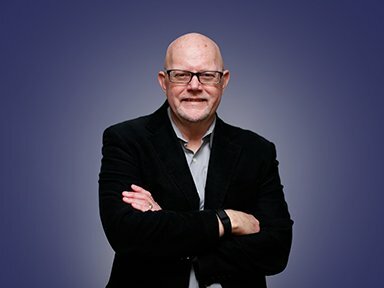 During that time, I’ve gained an extensive background in marketing and communications including market and brand strategy, marketing communications, sales and marketing analytics, email marketing, thought leadership, corporate communications, public relations, social media, websites, event planning, and more. My passion in life has always been to spread God’s Word and love to as many people as possible. Working at Manchester UMC gives me the opportunity to combine my communications skills with that passion. My goal is to bring the business acumen I’ve gained to the Church’s work, improving communications, reaching more people, and making a difference for Christ. I am married to my best friend and life partner, Jill. We are a blended family with four grown children and two grandchildren. Originally from the Appalachian region of North Carolina, I worked my way through school and attained my B.A. in Philosophy from Berea College in Berea, KY. I lived in CA briefly but moved to St. Louis pursuing career opportunities. Jill and I have called Ballwin, MO home for 20 years.